Notes may be decorated with a 'badge', a small icon that appears to the left of the note name in outline view and in the upper right hand corner of the note in map view (or lower right corner for containers/agents). The reason for this is that in the case of the containers, the part of the icon holding the title is comparatively small and a badge could intrude on that. Badges are not shown on icons displayed in the viewport of note and agent containers. Badges may be selected from the badge picker pop-over by clicking on the area where a badge is displayed (see list above). The note's badge is controlled by a string attribute $Badge, which holds the name of the badge. 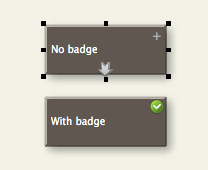 The value of $Badge may be set through inheritance, rules, or actions as well as well as manually via the pop-up list. Additional attributes control monochrome display ($BadgeMonochrome) and the exact size ($BadgeSize). When a note is selected in map view, a subtle "+" is drawn where the badge would appear if the note had a badge. This helps users discover the location of the contextual badge menu. Large badges with $BadgeSize > 32 respect the shape of the note and are clipped to its border. Small badges, as before, may extend outside the drawn region of the note.